Another Civil War battlefield, Shiloh, scene of Ulysses Grant’s first victory over the Confederacy. Very good movie at visitor center, but I got lost several times driving around the battle field. Seems that Grant really got lucky on this one. He was completely unprepared and defeated on the first day, but by great fortune reinforcements arrived just in time for victory on the second day. Lunch at a roadside BBQ joint with very friendly people. Grandma was playing with her two year old grand-daughter, who she said had never seen a stranger before, but was very happy to sit in my lap. Once grandma was gone the waitress her niece came over to talk. She is going to the University of Memphis in the fall, and dreams of becoming an English teacher in a foreign land – she desperately wants to escape this “hellhole of a county”. We talk about FAFSAs and saving money with used and rented textbooks, she seems to have a definite plan. 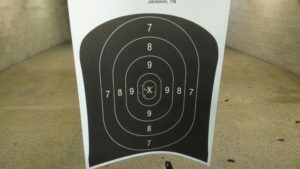 Then into Jackson to a shooting range. Got to find some America. Automatic weaponry. And Jesus- Range USA of Jackson is a family owned small business built and operated on Christian values and faith. Firing an AR-15 is really easy compared to a Lee-Enfield .303. Also fired a Glock 17, nothing to compare it to since this was the first time I have fired a handgun. 209 miles for the day.